Monday, leaders from our Racial Justice team turned out more than 100 people to pack the Des Moines City Council meeting to keep pushing our ordinance to ban racial profiling by the DMPD. Wednesday, we sued the state of Iowa for failing to protect our rivers, lakes and streams from factory farms and corporate monopolies that run our food systems and continue to pollute our water. This week presidential hopefuls also weighed in on the future of agriculture, with Senator Warren setting forth a proposal to break up big ag and Senator Sanders publishing an op-ed promising to fight for farmers. Their announcements come in advance of Saturday’s presidential forum in Storm Lake (my hometown!). People’s voices – through the forum, Iowa’s role in the caucus, and your bird-dogging – are making these candidates speak about issues we care about. We need to continue to push all of the candidates to include a moratorium on factory farms and economic justice issues in their farm policies, like: parity prices for farmers, supply management, and grain reserves. Candidates addressed these same issues in 2007, but we failed to see action after the election. You and I have a role in that. We have to build the power we need to pressure candidates to act on our issues once in office. In the Statehouse, debate started (and stalled) on a bill to hire a corporation to kick people off of Medicaid – in spite of of a judge in two states finding Medicaid work requirement unconstitutional. Next week is the 2nd bill funnel deadline. Will bad bills like net metering, voter suppression, and changing the judicial nominating process move forward? After that, attention will largely turn to Iowa’s budget so that legislators can wrap up by early May. Read on for ways to plug into the work over the next week. And, thanks for all you do. You’re the fuel that makes our justice bus run! Big thanks to the 55 of you who have taken us almost a third of our way to our $10,000 goal so far! The outpouring of love and support is phenomenal. This week, we sued the State of Iowa for failing to uphold their duty to protect our right to clean water. Why? Iowa’s increasing water pollution – and the state’s inaction – is unacceptable. People and our rivers, lakes, and streams are paying a very heavy price for the reckless, unaccountable behavior of factory farms and corporate ag. State leaders and our governor want us to trust corporate farms to do the right thing with voluntary measures. But there’s too much at stake to bet on voluntary practices that aren’t protecting our water. That’s why we’ve teamed up with Food & Water Watch and Public Justice on this new legal strategy. It goes along with our ongoing tough organizing to get Iowa’s water and quality of life back on track for the public good. Can you chip in $20, $50 or whatever you can to help fund this game-changing lawsuit to force the state to clean it up? 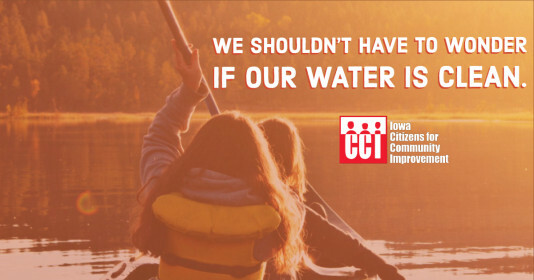 Iowa CCI is doing everything we can to keep our water clean – for us, our kids, and our grandkids. We need your help! As you know, legal action isn’t cheap. And, the Farm Bureau is going to come out swinging. That’s why we’re asking you to dig deep. Donate today. Whatever you can give will fund the legal work, and help us counter corporate ag’s misinformation at every turn. Between the ages of 18 and 30? 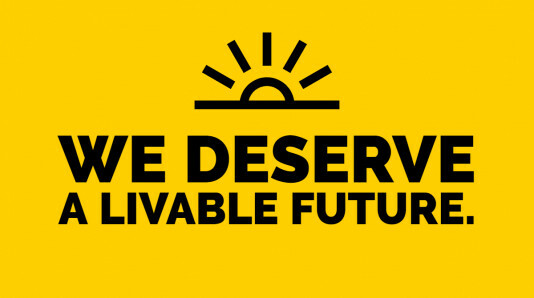 Apply now to the Sunrise Fellowship. The Sunrise Movement is setting up a hub house in Des Moines, where youth leaders will live and from which you will work on one of the following areas as part of a team: outreach, climate disaster response, birddogging candidates, art and design, training, policy development, press and media, or digital media, and more. Read the FAQ for more information, and then apply here. The deadline is April 7! Tickets and speaker names will be released soon! To be the first to know, RSVP here. This week, retired teacher and CCI member Ginny Meyer from Lone Tree traveled to Washington DC. She spoke out in support of the Green New Deal before the Senate’s vote on the resolution. She called out corporate ag as a player in climate change. “We need a new approach. We need the small minority of our progressive farmers, who are really good stewards of the soil, to become the rule, and not the exception. We need policies that put people and planet first! We need a Green New Deal.” Watch her clip on YouTube to hear more about CAFOs, clean water, and how factory farming connects to climate change. Thanks for following along, reading closely, and taking action for people and planet.Thanks for all you do!